When I completed the Hatman Site, I could sense there was more, so I kept on cruising around this area. Directly north above the Hatman sits an arrow that looks like it was carved or hollowed out of the ground and fills with water/snow, I don't believe Nature can form an arrow, but one never knows when it comes to this planets abilities. From tip of hat to arrow is 3.60 miles long. The arrow is 480.14 feet long and 328.79 feet at it's widest base. I wondered where the arrow was pointing, so I followed it's direction and lo and behold this arrow points directly to the largest spiral in the complex, 2200 feet wide as seen in Spiral Image 6. I'm thinking the arrow had to be intentional. 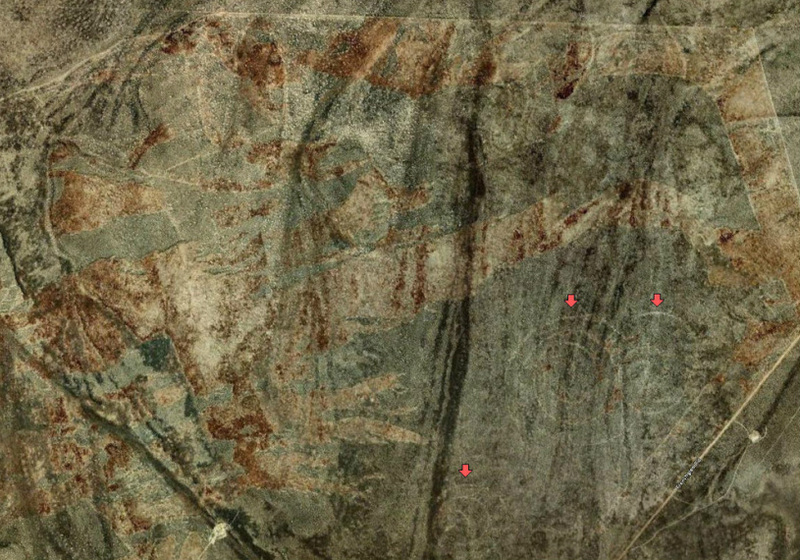 If you look to the left you will see what looks like a possible whale, prehistoric mammal (red arrows pointing to legs and body) and lines akin to Nazca. I must have cruised around this area for weeks searching for something else other than the group of spirals. My instinct kept telling me there was more, so the searching went on for months off and on while I cruised around in other areas, but I kept coming back to this, because truthfully this "pull" to that location was really bugging me. Just like the Hatman, I walked into my office one day and voila there it was right in front of my nose the entire time, all I needed to do was shift my focus to the larger picture.........a mural of what looks like a Native American man with a bird superimposed over his head. This mural is 2.27 miles wide. The Shaman is 4830.45 ft long, not including the bird over his head. Below is the same image, only enhanced once. I drew out what I saw. Now I held a greater understanding of why the arrow pointed directly to the largest spiral. The Hatman's side of face....tattoo. To the left of his head are the group of spirals that drop down into lines and more spirals. I believe this might be part of the most recent layer left by a civilization. In the upper image to the far left midway down, there is what looks like a grid pattern. Please see closeup below. 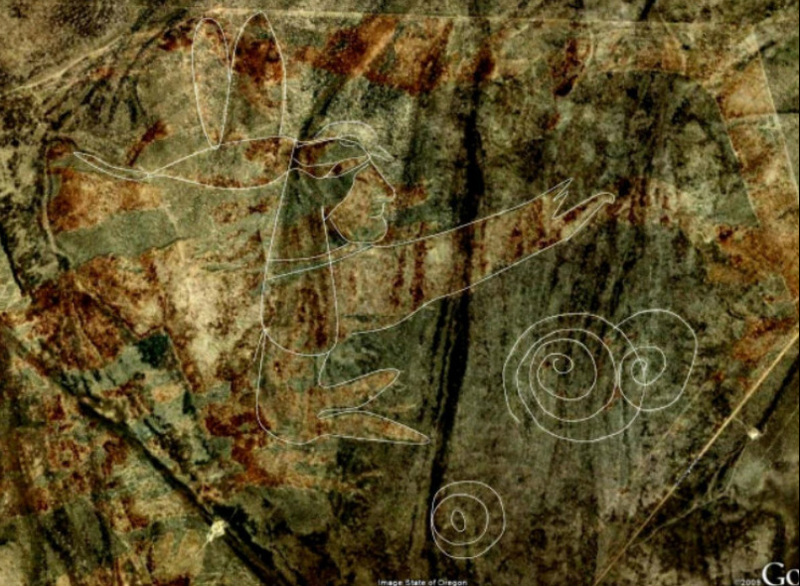 Below is an image that caught my eye right below the Shaman in the full mural image. I call it the "Skull Bridge". I'm sure this could very well be a fluke of nature, but one never knows.